Orientation lock and gallery update. Fixed a small YouTube playback bug. Fix events navigation bug and add fighter favourites. Looking for the latest breaking news and rumours in Mixed Martial Arts (MMA)? 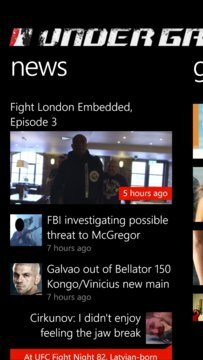 The UnderGround is an UNOFFICIAL Windows Phone client for the very popular www.mixedmartialarts.com.